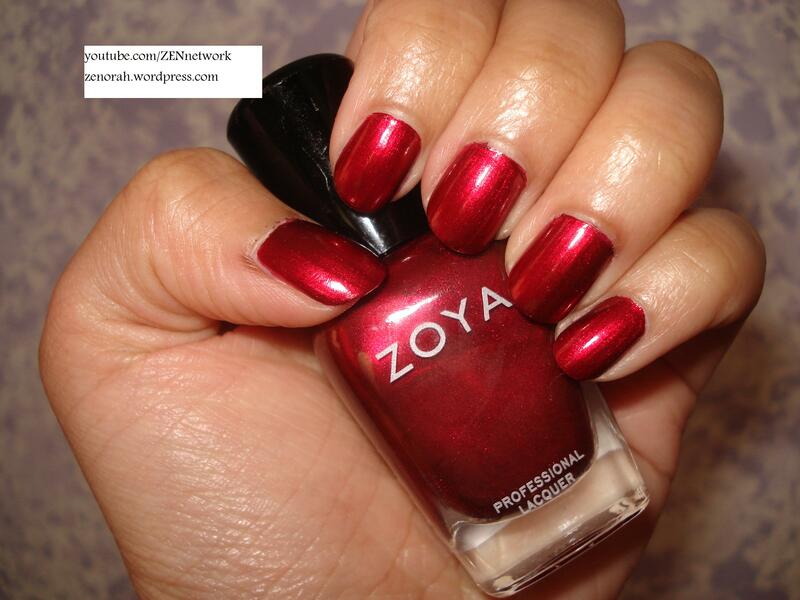 Zoya Isla – is a true cranberry red metallic nail polish – its texture and finish reminds me so much of gift wrap paper! I am not sure which collection this polish was released in but it really is a beauty. I have a weakness for metallic polishes done right and this one was done right! While this polish was opaque on 2 coats, I used a 3rd coat because I am in LOVE with the dark black edges this polish gives when you keep layering it – and for a bonus, it dries quickly in between coats as well. It bothered me for the longest time why I LOVED this polish so much, its just a metallic red but then it hit me! It completely reminds me of the show TRUE BLOOD in nail polish form. If I had the responsibility of creating a ‘red’ polish for that show – it would be this!! (*DREAM JOB !!!) In particular, it’s something I could see Pam wearing with her high heels and her hilarious one-liners!!! (True Blood fans know what I’m talking about lol). In addition, it looks a lot like Butter London Knees Up, while I do not own that polish – just based off of swatches I have seen online, they look pretty similar so if you have one you do not need both. In addition, I LOVE getting dolled up in all black clothing and wearing this shade, I dunno why but it makes me feel like a million bucks!!! And I can’t review this polish without saying, it’s the perfect ‘red’ nail polish to wear during winter & Christmas time. Do you own Zoya Isla? What are your thoughts on this nail polish?